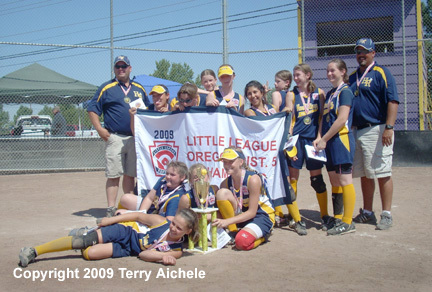 HERMISTON - The Hood River 11/12 year old Little League softball team defeated Hermiston on Thursday, July 2, 2009. 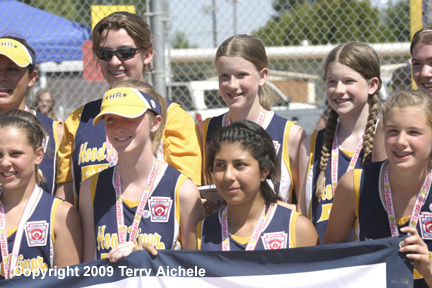 Hood River won the championship game 12-9. 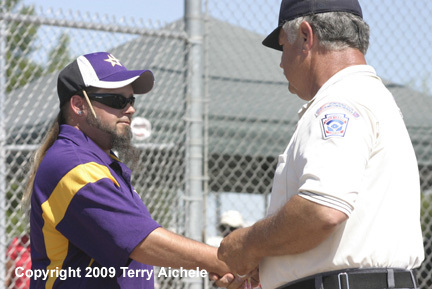 This was the third meeting of the teams in the District 5 Little League tournament. The rubber match. 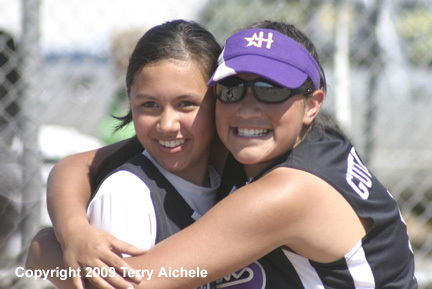 Hermiston won the first game on Saturday by a score of 7-4. 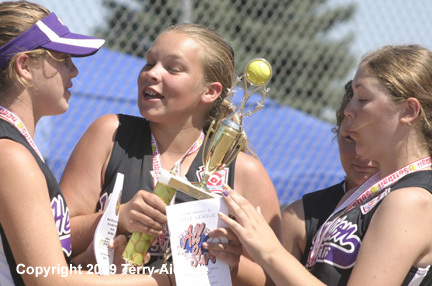 Hood River won the first championship game on Wednesday by a score of 10-6. 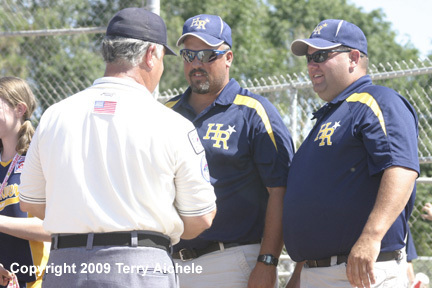 The players and coaches had gotten to know each other somewhat over the course of the week and spirits and anticipation ran high in the minutes before the start of the game. In the ten minutes or so before the game the two teams exchanged cheers and chants meant to empower their own team and challenge the players on the other team. 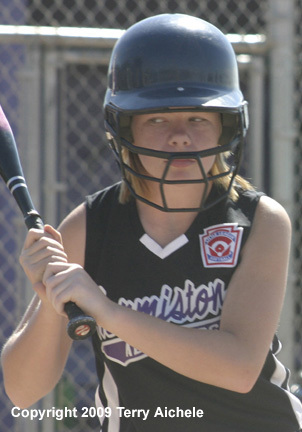 Hermiston was the first team to score in the bottom of the first. Marissa Crowe scored from second on a hit over the shortstop's head by Mackenzie Juul. 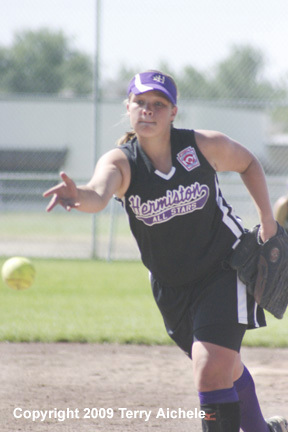 Hermiston took a 1-0 lead. Hood River scored in the top of the second. 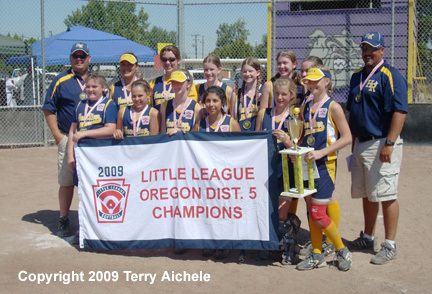 Kayla McCafferty was on first and Kelsey Wells was on third. A wild pitch allowed Wells to score from third tieing the score at 1-1. 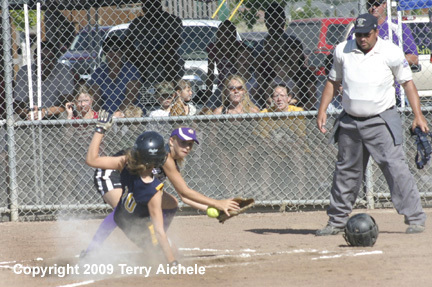 Hermiston scored in the bottom of the third. 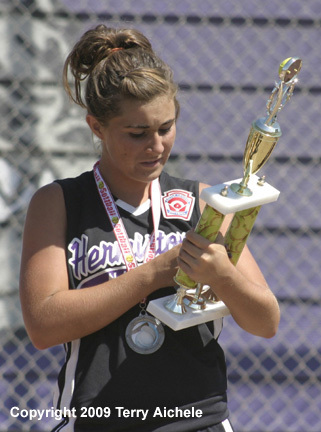 Hermiston had the bases loaded with Juul at first, Crowe at second and Dayna Horn on third. Elizabeth Weems hit to secondbase and the throw to home was off allowing Horn to score. Hermiston took the 2-1 lead. Crowe then scored on a wild pitch making the score 3-1. Amanda Pollick hit to centerfield with Juul scoring from thirdbase pushing Hermsiton's lead to 4-1. Kimberly Nevil hit to rightfield scoring Weems and Rebecca Engelbrecht and giving Hermiston the 6-1 lead. 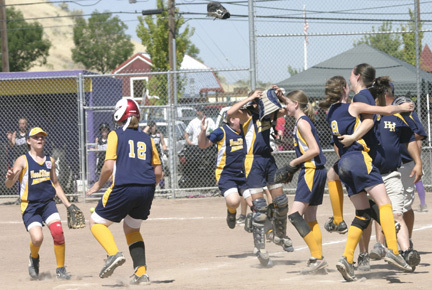 Hood River came right back in the top of the fourth. With two on, Celeste Martinez hit driving in a run. A walk and a stolen base later Martinez scored on a pass ball. That made the score 6-3. Breanna Weekly then hit to thirdbase and Jenni Packer scored from third. 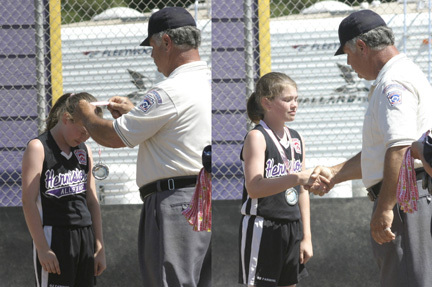 Next up was the tall outfielder Lauren Winans who hit a fly ball to centerfield that was missed by the centerfielder. 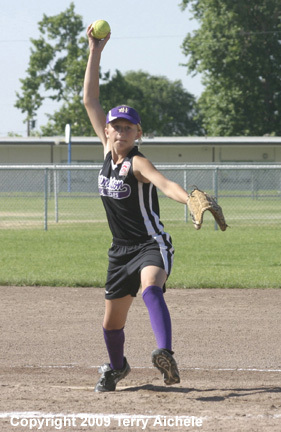 That drove in Tabitha Merten closing the score to 6-5 and what seemed like a big lead for Hermiston had dwindled to one run. 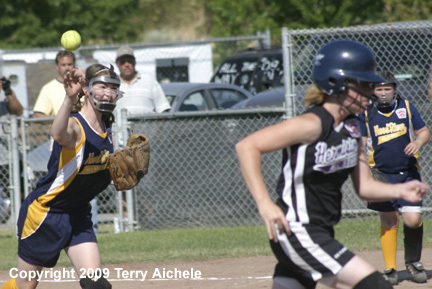 Kayla McCafferty hit through the shortstop and into leftfield through the backup fielder. That hit scored Weekly and Winans and giving Hood River the 7-6 lead. A hit up the middle over secondbase scoring Wells made gave Hood River the 8-6 lead. 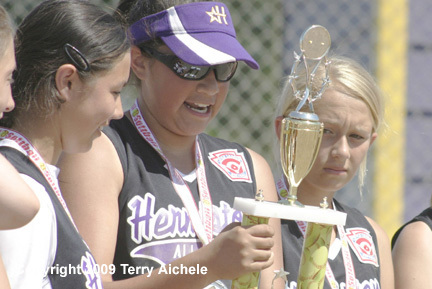 Hermiston wasn't able to score in the bottom of the fourth. Hood River, however, just kept up their scoring in the top of the fifth. 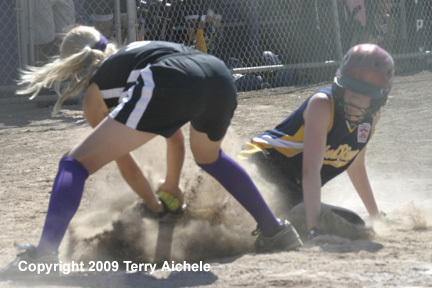 Hood River loaded the bases and then Weekly hit into a doubleplay. Then Lauren Winans blasted a hit to centerfield that scored Taylor Shelton and Merten and giving Hood River a four run lead, 10-6. 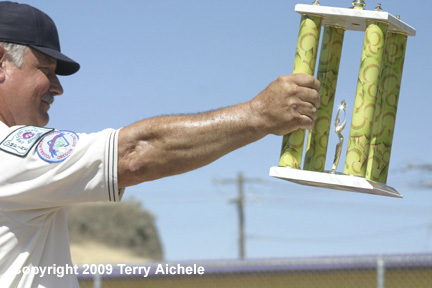 The next scoring occurred in the top of the sixth with the bases loaded. Shelton was hit by a pitch driving in a run and giving Hood River the 11-6 lead. A hit to leftfield scored the last runner for Hood River and the 12-6 lead. 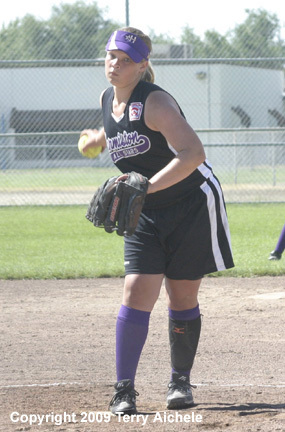 Hermiston came out in the bottom of the sixth wanting take control of the game. With Jazmin Gutierrez and Kalene Wheeler on base Crowe hit to centerfield scoring Gutierrez fromt third. Juul flewout to leftfield but Wheeler was able to score from third. Weems hit a liner which she was safe at first on a throwing error. 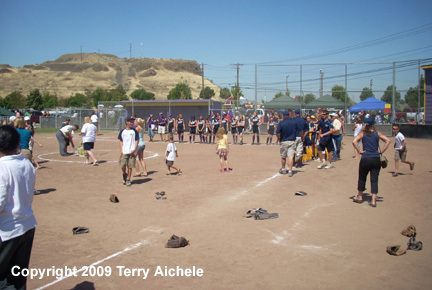 The hit scored a run and making the score 12-9. 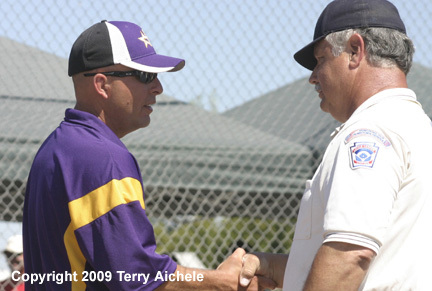 A runner was called out after leaving the base early and that ended any chance for Hermiston to keep the comeback alive. 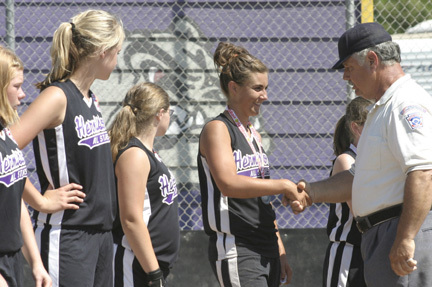 Once it sunk in that the Hermiston runner was called out for leaving the base early Hood River players lept and ran together to celebrate their win. 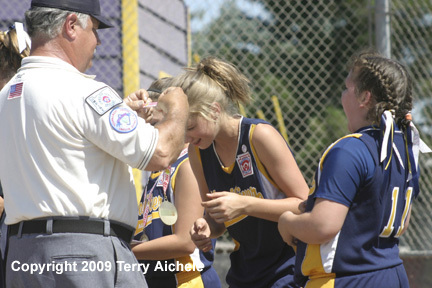 Moments later the teams exchanged handshakes and lined up for the awarding of the medallions and the trophies.